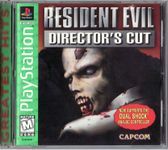 Capcom's successful "survival horror" game, in which the player tries to solve puzzles and escape a mansion filled with zombies, using quite limited amount of ammunition. Biohazard successfully used the control system that allows for a cinematic, static yet ever-changing camera angle, that was first used in "Alone in the Dark". The horror draws nearer! An epic fight for survival! This is the essence of survival games! !